Sorry for the false post a few days ago — this is the real one. 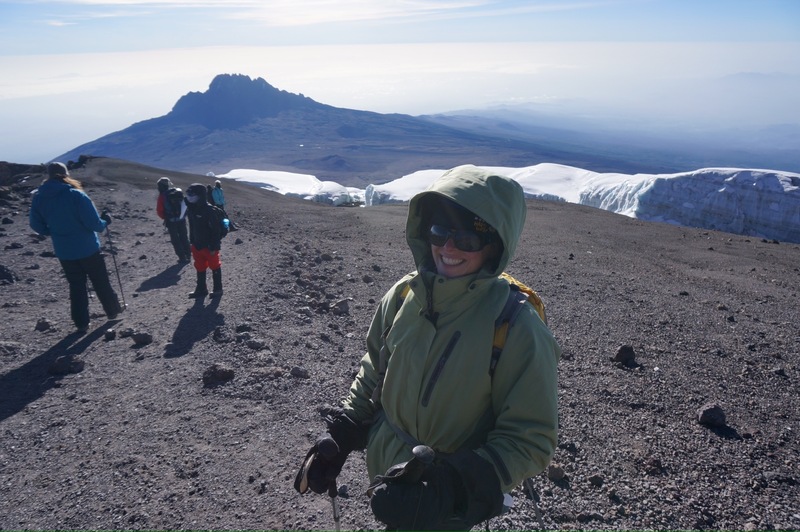 Summiting Kilimanjaro is not for the faint of heart. Turns out, I’m extremely faint-hearted. Good thing my wife is less so, otherwise I’m not sure we would have made it. The first five days were a cakewalk. Our vital signs were great, we felt great, and 4-6 hours of moderate hiking was pleasant. Then came the summit, which was like going from kindergarten teeball to the Major Leagues over night. At dinner on the 5th day they tell you what to expect: Don’t look up. We’ll go extremely slowly so that we need very few breaks due to the cold. “Should I wear this third layer?” Yes. “How about this fourth layer?” Yes. “And I have this fifth layer…” Yes. “Also, should we bring toilet paper?” Yes. 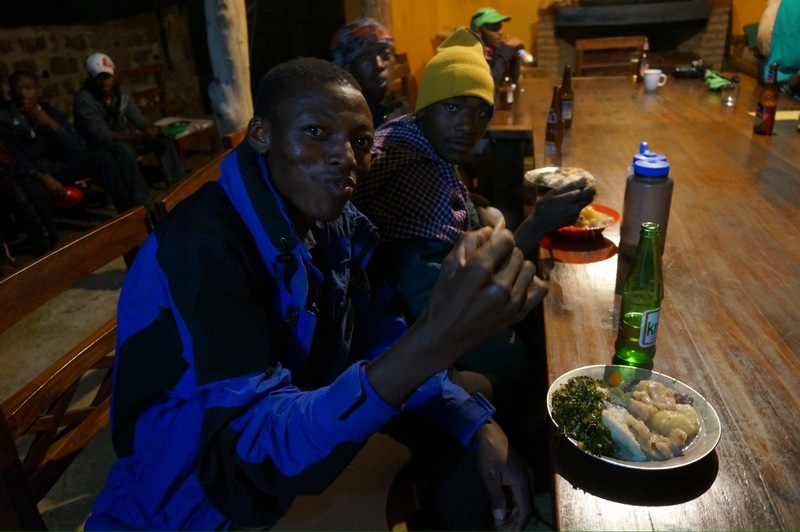 They wake you up at 11pm after a post dinner nap, if you can sleep — we hardly could because of the anticipation, as well as the altitude (16,000 feet at Barafu Camp) and the cold. You have a brief snack around 11:30pm, make final preparations, then head out at midnight. It’s pitch black, except for an endless trail of headlights straight ahead — rather, straight up. Everyone tells you not to look up, which makes you want to do nothing but look up. It’s truly daunting. And when you hike up for what seems like hours to the first “ridge,” you realize it’s not a ridge at all and the headlight ants continue for miles still. Pretty soon into our midnight hike, Jill started to feel awful. Very nauseous. She seemed wobbly on the trail, which is steep and narrow, and I got nervous for her. She sat down on a boulder and tried to close her eyes for a second, which is when I first thought something might be seriously wrong — it took a reminder from Ayumwi that she couldn’t doze off there (in the middle of the trail in freezing temperatures). She was in bad enough shape that we contemplated turning back. But she got up, went “to go see a man about a horse” a little further off the trail, had some electrolyte-infused water, a bite of a Cliff Bar, and then soon started to feel much better. Just about as soon as Jill started to feel better, I started to tank. I felt lightheaded, nauseous and just exhausted. The altitude was crushing me. We were only two hours into the summit hike and I was completely miserable. 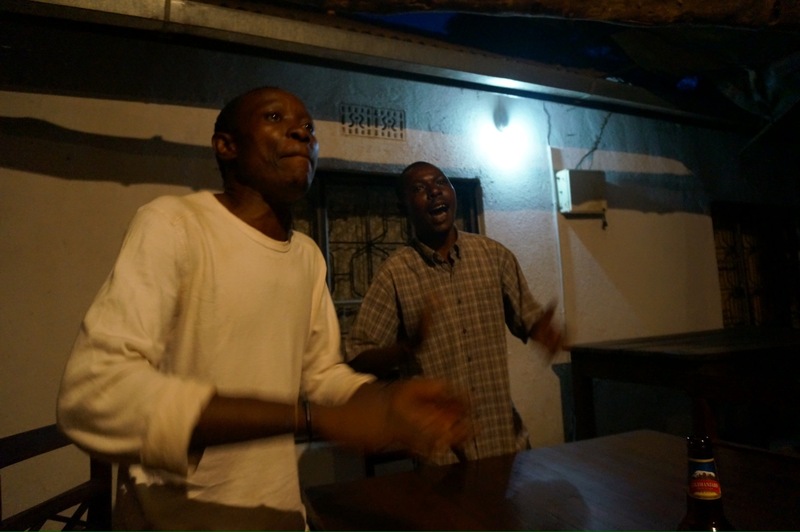 Ayumwi and John kept telling me to throw up if I could — and boy did I try — but I just couldn’t get it out. We must have seen six other people throwing up on the side of the trail, so I clearly wasn’t alone in my state. Unfortunately, I didn’t get better. As we kept climbing, I kept feeling weaker and weaker, and more and more nauseous. Jill and I had both tested great on our vital signs up to 16,000 feet but I guess those last 4,000 are another story. Every step was brutal. We couldn’t feel our fingers or toes, our remaining water was completely frozen, we were physically exhausted, and the altitude was eating me alive (and while I wasn’t exactly thrilled that Jill took this photo of me at time, it makes for good blog material). 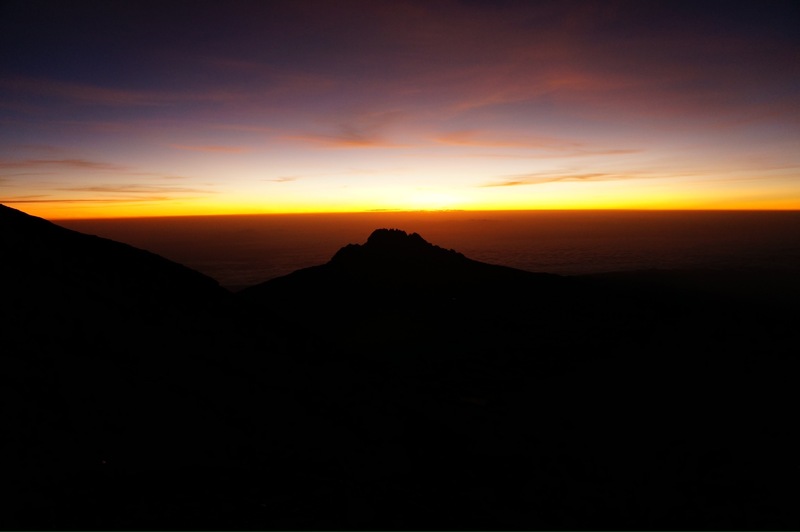 Finally, the first sign we were close was the sunrise over neighboring Mewenzi Peak, which at 18,000 feet is the third highest in Africa. 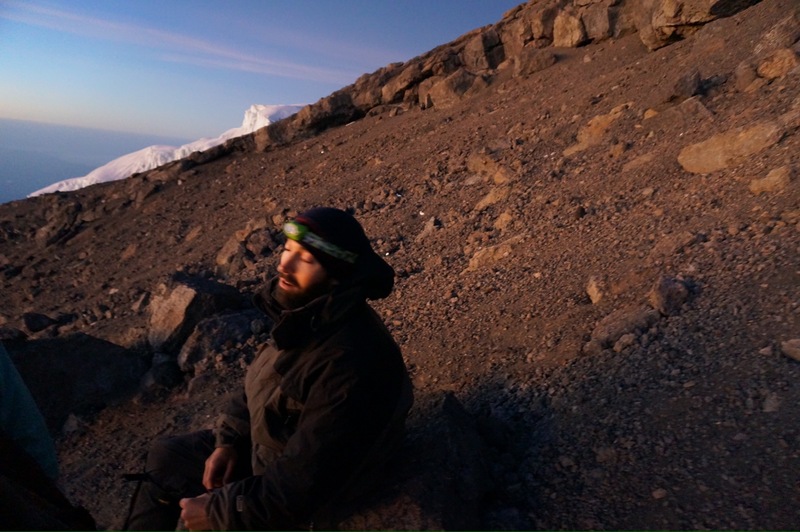 We were told it would take anywhere from 6-8 hours to reach the summit, so if we had left at midnight and were now seeing the sunrise we were getting close. And getting out of the dark certainly helped our spirits a bit too. Those last thousand feet or so to the lip of the crater were just brutal. I had to go about ten steps at time then take a break. But there was no way I was turning around. I knew it wasn’t about winning… ok it was all about winning and goddammit I was going to make that stupid summit. 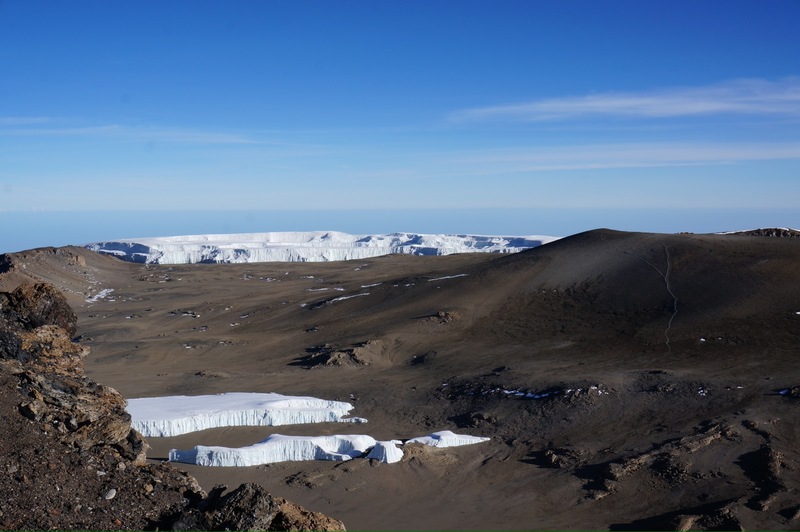 We hadn’t been on remotely flat ground or taken more than a 30-second break (due to the cold) for seven hours, so when we finally reached the ridge I just about completely collapsed onto a boulder and stared out into the crater. I couldn’t speak. Jill came over and we were both crying. It was that punishing, and that rewarding. 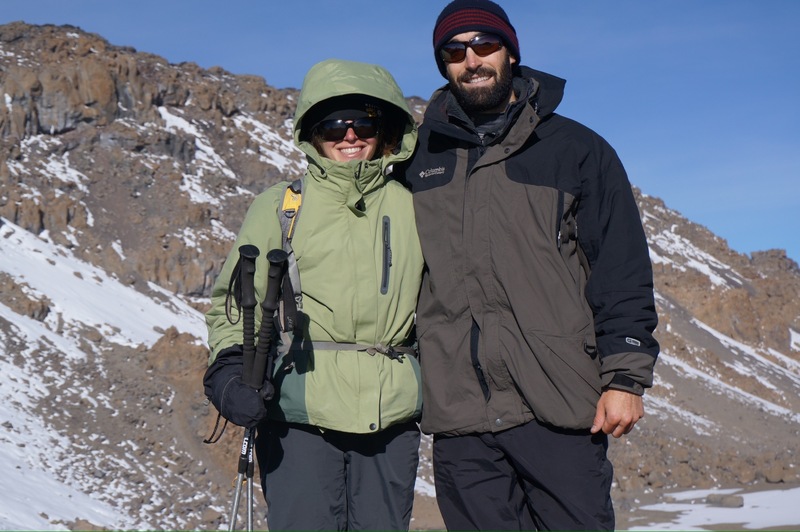 The final kick in the shorts was that we still had another hour to hike up around the rim to reach Uruhu Peak, the actual tallest part of the mountain and the single highest point in Africa. That hour was just as brutal as the last. But reaching it was an unrivaled feeling. After about 10 minutes at the summit taking photos, we got the hell outta Dodge. It only takes 2-3 hours to get back to camp because you slide down this massive meandering loose dirt trail alongside the one you went up. Descending can be more dangerous than summiting, since trekkers are completely exhausted and therefore super accident-prone. I watched a guy right next to me try to slide down too quickly, slip, and break his ankle. 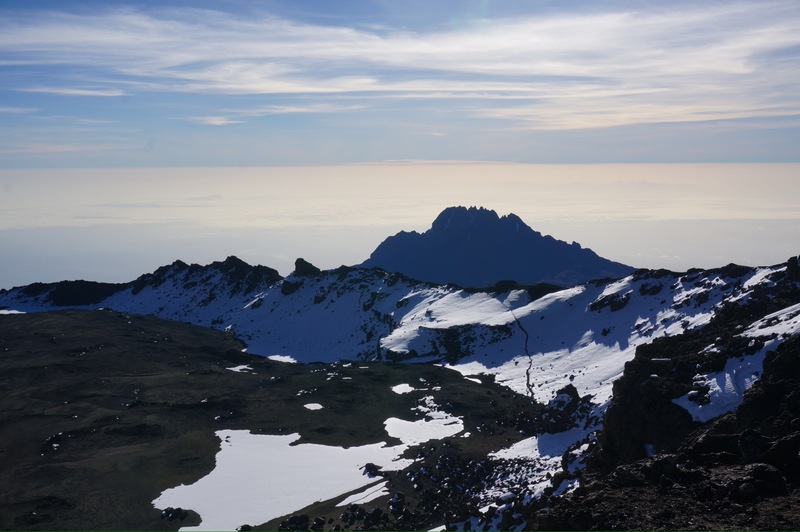 Three guides had to carry him down the remaining 3,000 feet from the summit to get him in a wheelbarrow-like stretcher — and then down a horribly bumpy trail for the last 16,000 feet. Our guides later told us that three people that morning had to be taken down in a stretcher. 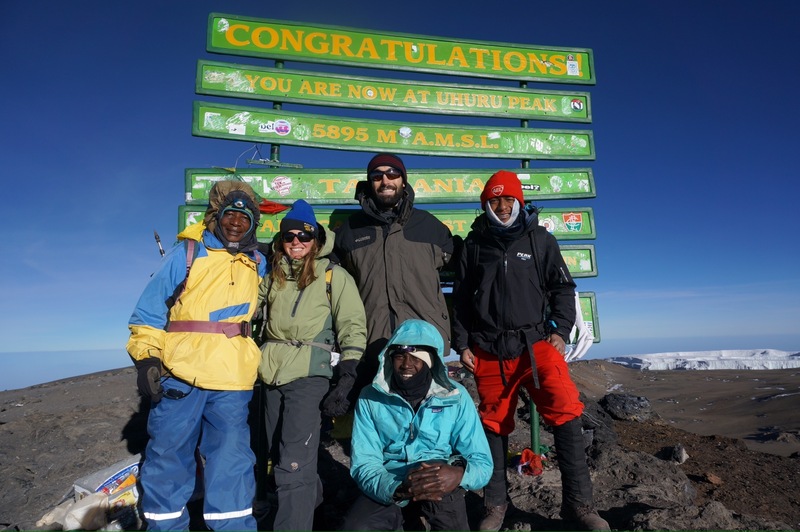 We also found out later that a nice guy gamed Eric to whom we had given a ride from the Kili airport made it to 19,000 feet before vomiting blood and needing to be raced down the mountain due to acute altitude sickness. 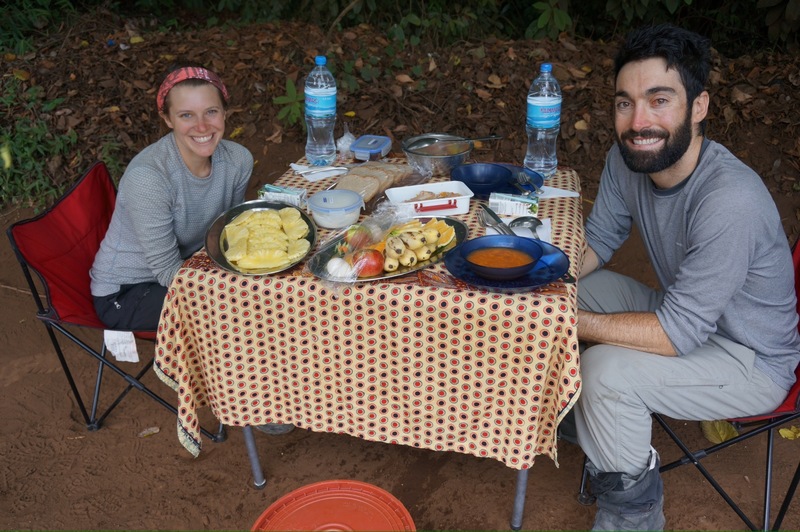 We slept like babies that night then had a relatively easy five-hour hike back down to the gate, where we had a final picnic lunch before heading to Mbahe Farm for our first shower in a week and a farewell dinner party with all of our porters. 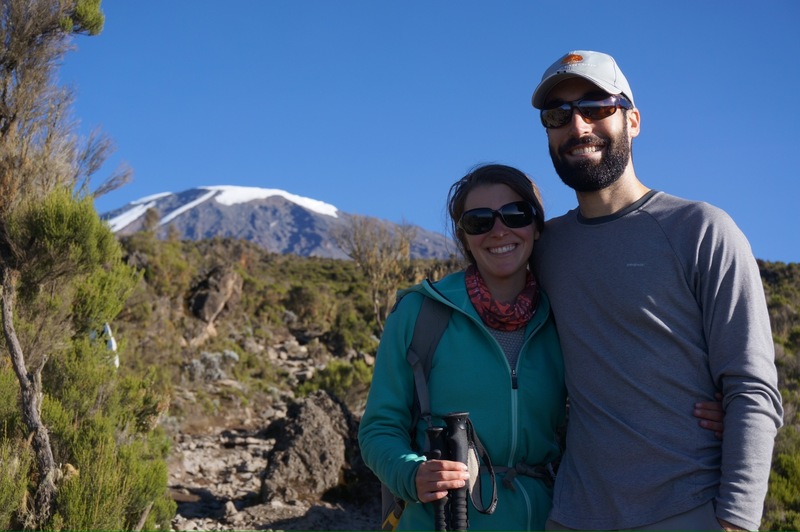 So given all that… Would I recommend summiting Kilimanjaro? Absolutely. 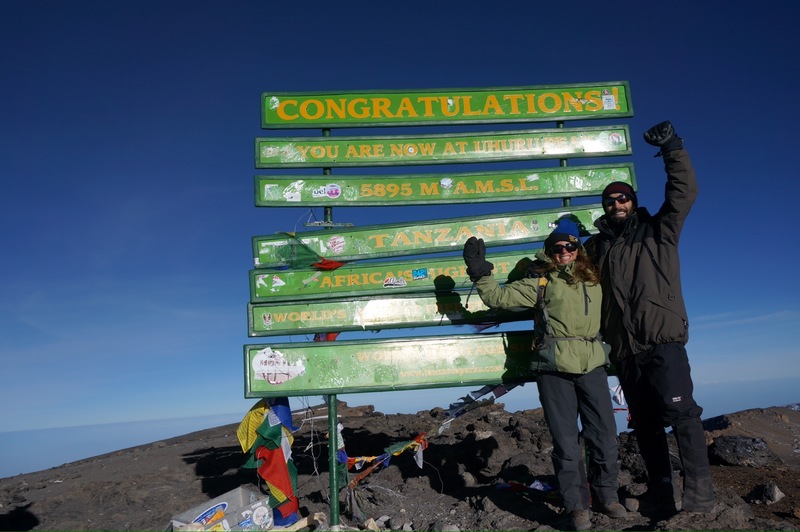 It was brutally hard, and perhaps harder for me and Jill than others, but we both consider it the greatest physical achievement of our lives. Simon’s company, SENE, earned a Triple A+. 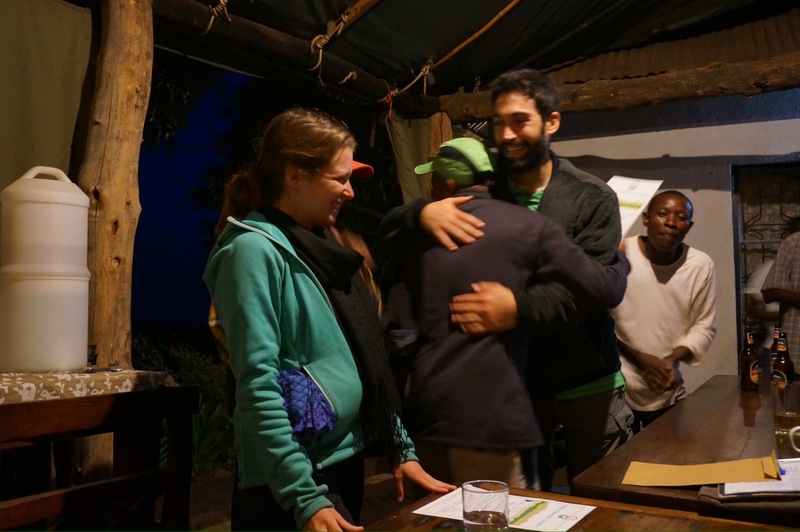 Amazing competence, professionalism and support from top to bottom — from Simon himself, the office, our guides, our porters, Mbahe Farm, the food, everything. Thanks to Catie and Sharon for introducing us to Simon at Catie’s wedding in California! All in all, an experience we find ourselves reminiscing about constantly, and one we’ll surely never forget. 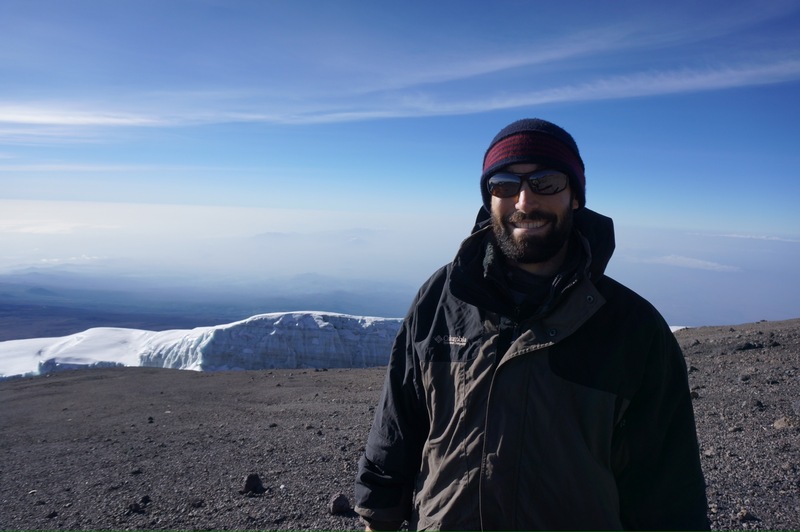 This entry was posted in Kilimanjaro, Tanzania on March 10, 2013 by Dan. Thanks Graeme & Mel! Hope you had a great time in the Maldives. It’s 10:23 p.m. and I had to finish the blog so we could all get to the summit. So glad we made it but unlike you two, I’ll never go to sleep thinking about what you had to do to get to the top! Congratulations!! Just amazing, well done. Congratulations!! Dan — I worked on Spacify to YV url re-directs this weekend. The similarities? It seemed treacherous and insurmountable at first… enjoy the rest of your journey. Also, glad to hear that I am not the only one who barely made it to the top. I really really struggled! We sooooo want to do this! Thanks for giving us a realistic idea of what it’s going to be like!